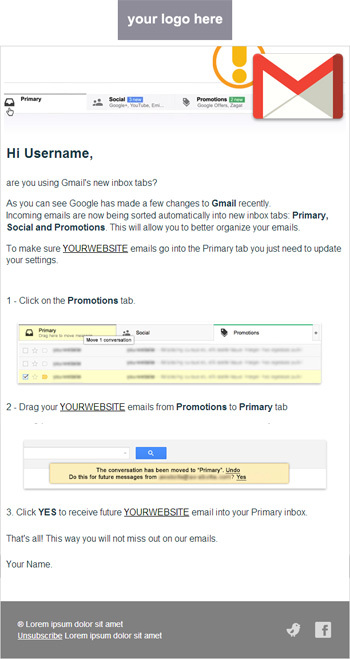 Even if the impact of the new Gmail’s layout is not dramatic, many big brands like LivingSocial and Gap sent to their subscribers an email instructing them how to move their emails to the Primary tab. To make it easier, we created an HTML email template that you can use to explain to your subscribers how to change settings in their Gmail inbox if they woud like to receive your emails directly in their Primary inbox. Now feel free to add your logo, edit text or add images: any section of the template can be customized! Obviously, do not send this email to your entire list. We recommend that you segment your list for those emails that contain “gmail.com” before sending the Gmail message out.